When you join Core Credit Union you become a Member and not a customer. This is an extremely important difference as it means you are a part owner of the Credit Union with equal rights to vote and participate in decisions affecting the Credit Union. Membership brings with it rights as well as responsibilities. The money you save is held as shares and it is this pooling of shares that creates the loan fund from which you and other Members can borrow. When borrowing, it is important that you borrow wisely ensuring that you protect your shares and the shares of your friends, family and neighbors. To become a Member of Core Credit Union you must hold our Common Bond. This means you or a member of your family*, must live or work in the area outlined on the map below. Credit Unions operate on the co-operative principal of communities, linked by a common bond, working together to help each other. 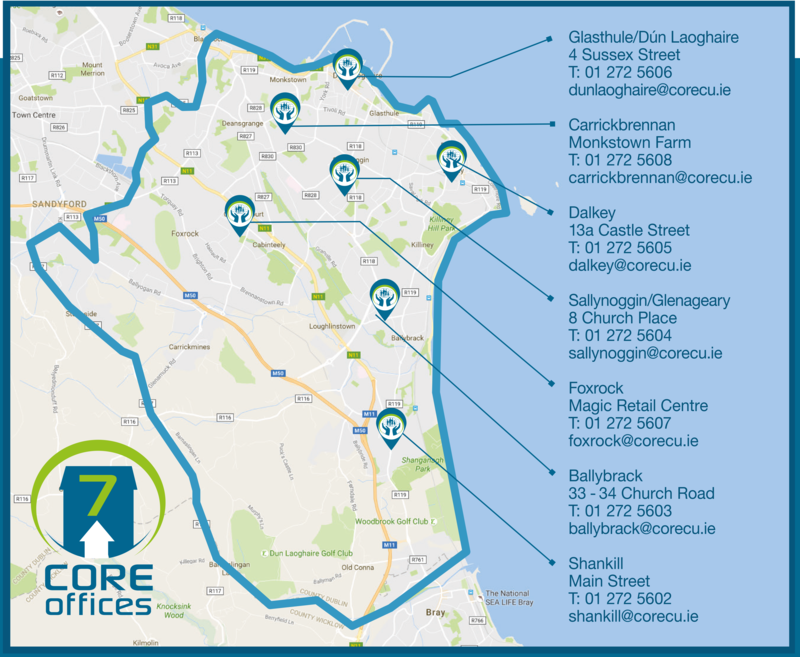 For some Credit Unions the common bond is defined by their occupation or their employer, for Core Credit Union the common bond is defined as living or working in the area around the Core Credit Union offices as highlighted on the map below. Evidence of Address must be dated in the past 12 weeks. €11 to activate the account. Drop into any of the Core Credit Union offices with the paperwork listed above and a member of staff will take it from there. If your require any further information about membership of Core Credit Union or the products and services we provide, please do not hesitate to contact us. *Definition of Family is contained in the policies of Core Credit Union Ltd. In summary a family member must live in the same household. Please enquire for further information.